Math is a powerful force in my life. In school, you are taught how basic math skills will become part of your everyday life. It’s not just a problem on the chalk board or on your homework. 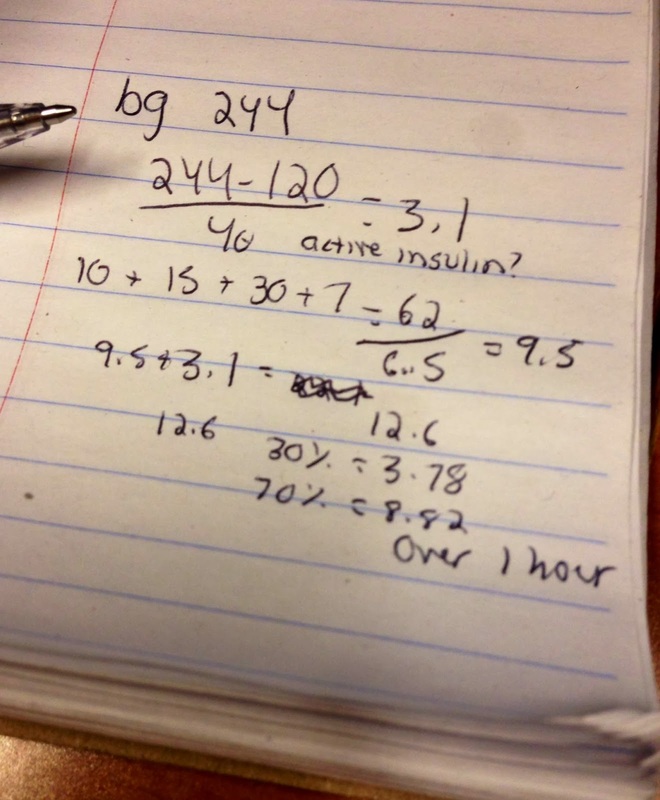 You will use math every day in countless ways: figuring how much change you’ll get when you pay with a $20, what is a 20% tip on a $15.65 meal, how much flour do you need if you are doubling the recipe, etc. It’s easy to think of professions and situations where a miscalculation can be disastrous and detrimental. A mistake in a budget can cost a company thousands or even millions of dollars, a builder’s wrong measurement can compromise an entire structure, or a doctor’s miscalculation of dosage could be lethal. However, for most of us in our every day lives, the consequences of our calculations are not as significant or potentially harmful. Diabetes changed all that for me. It’s a disease of countless and continuous calculations. And while technology has aided with some of the calculations thanks to features like the bolus wizard, there is still so much that the individual must figure out. But unlike a school assignments where a wrong answer is designated with a red “X” or minus points, a miscalculation for me has a direct effect on my health. This was clearly demonstrated to me last night. Carb counting in theory is simple, you take how many carbs are in a food and divide by your carb ratio (how many units of insulin to give for a certain number of carbs) which is determined by your doctor. For instance, if your carb ratio is 1:15, for every 15 grams of carbohydrates, you would give 1 unit of insulin. However, in actuality, carb counting is never that simple. When it comes to meals, you can rarely just look on the box and have a magic number, most meals are a combination of foods in different proportions, and many not coming from a box. Even looking online for “lasagna” can give you a rough idea of the number of carbs, but it’s still going to vary based on the ingredients you used and your serving sizes. I’m also more of a grazer when I eat, a little of this, a little of that, more of this, which definitely doesn’t make the process easier. Dinner: Smorgasbord of leftovers and prepared food from local grocery store. Spoonful of brussel sprouts and small serving of grilled vegetables. Well there probably isn’t a lot of carbs in the vegetables, maybe around 10 based on my serving. Sliver of pizza. Well I know roughly how many carbs are in a normal piece of pizza, but is this piece bigger or smaller? But I only had 1/3 of the piece, so should I just divide a typical piece of pizza by 3? 1/2ish cup of risotto. Granted I didn’t actually measure it, but it was roughly 1/2 a cup, I think? But I don’t have a box to look at since we bought it prepared. I guess I’ll estimate based on looking it up in the past. A few more bites of pizza. How many carbs in a few bites? I added this all up and put the total carbs into my pump which divided it by my carb ratio for this time of day. Then it was on to dessert. I made a cup of decaf coffee and put some flavored creamer in. A few carbs in that. Then the desserts came out. I couldn’t even tell you what I was eating, let alone how many carbs are in them. Some kind of sugar covered fried muffin, a lemon cake thing, and some other kind of bar. My family cut off little pieces of each and picked from the plate, a typical style of eating in my family, but hard to determine just how much I ate and how many carbs it is. I took my best guess. I felt relatively confident in my decisions that night. It was a more difficult meal with so many different types of foods and different portion sizes. However even if I was off, I didn’t think I’d be off by more than 10ish carbs. Somewhere along the way I had miscalculated, and around 10:30 pm about 2 hours after our late dinner and when I was all ready to go to sleep, my blood sugar fell to 42. Not that a low is ever pleasant, but this particular low was a bad one. I laid in my bed, shaking, light headed, disoriented, feeling awful. Where did I go wrong?! How were my calculations this far off?? It’s not often that this happens, when I am so off in my calculations. When I think about the fact that I do this at least 3 times a day, every day for 13 years, I can say that I’m typically pretty good at carb counting. When I am off, I more likely end up with a high blood sugar instead of a low. However, it’s these rare instances that remind me how important math has become in my life. One miscalculation hours earlier can drastically effect my health and how I feel. Now that is some powerful math. I am absolutely a grazer and totally identify with this! My pump makes it easier than injections – I can take some beforehand and then recalculate at the end and see if i reckon i need more insulin added to what i already took, but then when you graze on things they seem to ooze carbs out somewhere or take them up from things they were next to on the plate that you didnt acutally eat or something. Or something. I dont know.